These quotes from Pope Francis shine a light on the warmth and wisdom of the Pontiff. While most of his sayings focus in our church teachings, he’s not afraid to touch on topics related to the world’s stage. He died, He was buried, He rose and He appeared. Jesus is alive! 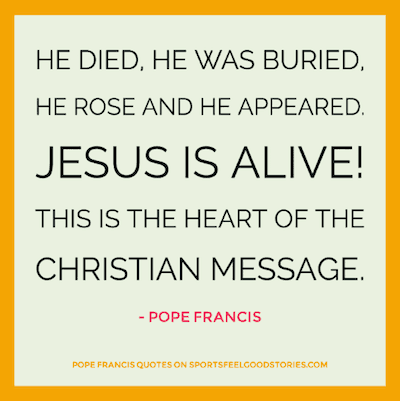 This is the heart of the Christian message. May Jesus, who vanquished the darkness of sin and death, grant peace to our days. Let’s promote friendship and respect between men and women of different religious traditions in order to build a world of peace. Whenever we look to Mary, we come to believe once again in the revolutionary nature of love and tenderness. By his resurrection, Jesus Christ has set us free from the slavery of sin and death, and has opened before us the way to eternal life. Mary teaches us to place our hope in God even when all seems without meaning, even when He seems hidden. With the Ascension of Jesus, we participate in the fullness of life with God. Let us carry this in our hearts in our daily lives. Let us all ask for the gift to understand God’s word. Rejoice! Hidden within your life is a seed of resurrection, an offer of life ready to be awakened! God is greater than nothingness, and a lit candle is enough to overcome the darkest of nights. Everyone has something to give to society; no one is excluded from contributing to the good of all. Practicing charity is the best way to evangelize. The ‘Big Bang,’ that today is considered to be the origin of the world, does not contradict the creative intervention of God, on the contrary it requires it. We know well that with Jesus life becomes richer and that with him it is easier to find meaning in everything. This is why we evangelize. If we think that things are not going to change, we need to recall that Jesus Christ has triumphed over sin and death and is now almighty. What kind of love would not feel the need to speak of the beloved, to point him out, to make him known? May our attitude be gentle and humble, attentive to caring for the poor. Let us allow ourselves to be surprised by the newness that Christ alone can give. May his tenderness and love guide our steps. An evangelizer must never look like someone who has just come back from a funeral. Let’s work together to increase solidarity and sharing. 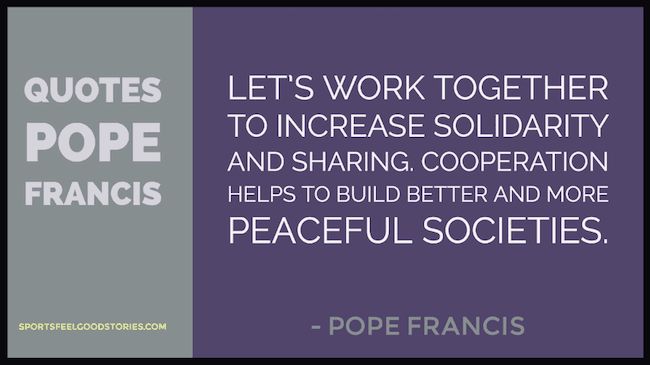 Cooperation helps to build better and more peaceful societies. 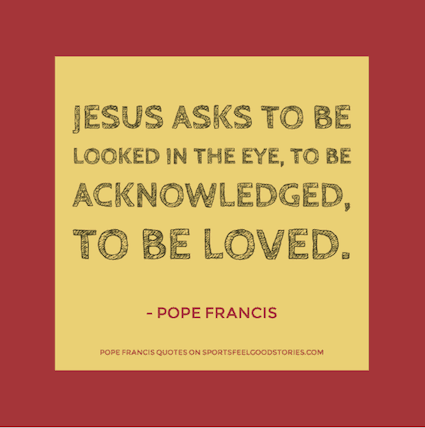 If you have any suggestions for quotes from Pope Francis, please let us know on the Contact page. Thanks.